Revelation 12 is one of the most important chapters in the New Testament for understanding the devil’s perspective on the cross. 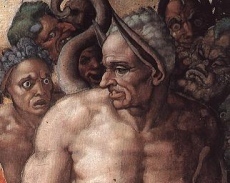 There Satan is portrayed as full of rage because he has been banished from heaven and knows that his time is short. He has not been able to crush Jesus, so he vents his rage on the church. He is the “accuser of the brothers” who wants simultaneously to roil their consciences and to accuse God of ungodliness because God accepts such miserable sinners as these. But believers, we are told, defeat Satan on the ground of “the blood of the Lamb” (Rev. 12:11)—an unambiguous reference to the cross. What does this mean? Nothing in my hand I bring, Simply to the cross I cling. Before that appeal, Satan has no retort. God has retained his honor while redeeming a rebel brood. We can be free from guilt—both objective guilt before a holy God and subjective awareness of guilt—not because we ourselves are guiltless, but because Jesus “himself bore our sins in his body on the tree, so that we might die to sins and live for righteousness; by his wounds you have been healed” (1 Peter 2:24). That night the angel of death passed through the land. Who lost his son, Mr. Smith or Mr. Jones? The answer, of course, is neither. The fulfillment of God’s promise that the angel of death would simply “pass over” and not destroy their firstborn depended not on the intensity of the faith of the residents but only on whether or not they had sprinkled blood on the doorposts and on the lintel. In both cases the blood was shed, the houses marked; in both cases the firstborn son was saved. So also with us who have trusted Christ and his cross-work on our behalf. The promise of deliverance, the assurance that we are accepted by Almighty God, is tied not to the intensity of our faith or to the consistency of our faith or to the purity of our faith, but to the object of our faith. When we approach God in prayer, our plea is not that we have been good that day or that we have just come from a Christian meeting full of praise or that we try harder, but that Christ has died for us. And against that plea, Satan has no riposte. D.A. Carson, Basics for Believers: An Exposition of Philippians (Grand Rapids: Baker Academic, 1996), 40-42 (bold emphasis mine).